Any job that involves sitting for long periods of time puts a heavy load of stress on your lower back. Most of us spend our day working hunched over computers, and that means lower back pain is a constant companion. Doing exercises to strengthen these muscles is one of the most important time investments you can make. It’s the lower back that keeps us upright, defines posture, and acts as the platform for every physical activity you can think of. That’s why all well-designed training programmes begin with strengthening the core of the body, of which the lower back is the prime focus. And anyone who has experienced debilitating back pain knows the value of strengthening the area. 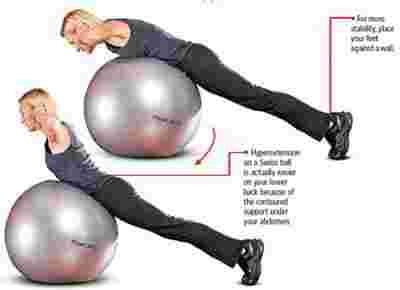 Lower back exercises are also convenient to do, because most of them involve no equipment. People with back pain often believe that exercising the back will only increase the pain. In fact, spine specialists actually recommend lower back exercises and stretches for relief from back pain, and consider it the best way to reduce pain, increase function, and prevent further recurrences. If you suffer from chronic back pain, do consult a doctor for a properly tailored regimen of workouts specifically targeted for your condition, but for every one else, here are three variations of one of the most effective ways to strengthen the lower back. Every fortnight, experts show you the perfect way to execute the most functional exercises that give your body the maximum benefit. Information and model: Karen Venter, master trainer, Ozone Fitness and Spa, New Delhi.